On the southeast corner of Oak and Howes Streets stands a grand old building — the Masonic Temple. While the lattice windows and the pocked, cream colored brick are distinctive, it’s the central portico with six tall Tuscan columns supporting a triangular pediment that really grabs the viewers attention. Designed by William N. Bowman (the same architect that designed the old Fort Collins High School on Remington Street) it has a Classical Revival style as befits a Masonic lodge. The Masons got their start locally under Henry Clay Peterson (the same Peterson that founded the flour mill with Auntie Stone — what is now Ranchway Feeds). Originally meeting at the mill in a building referred to as “Peterson’s work shop”, they moved in 1870 to Old Grout at the corner of Linden and Jefferson. By the mid 1870s, they met on the second floor of Stover & Tomlin’s General Store (where the Fort Collins Rescue Mission is today). And in 1880, they moved to the 3rd floor of the Linden Hotel (AKA the Loomis Block). But with expanding enrollment and a desire to get out of the “old” part of town, they built a new lodge in 1903 on the 100 block of W. Mountain (where the Rio is now). 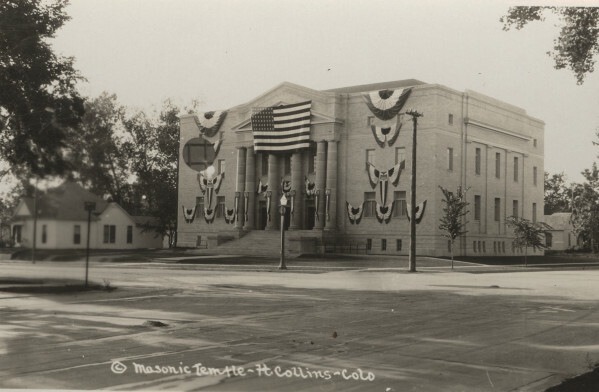 Continuing growth led to a need for an even larger meeting space, which is how the current Masonic Temple came to be located where it stands today at the corner of Oak and Howes. Image from the website of the Fidelity Lodge, No. 192. When the Masonic Temple was built in this location, the county courthouse stood across the street, but otherwise there were houses in every direction. 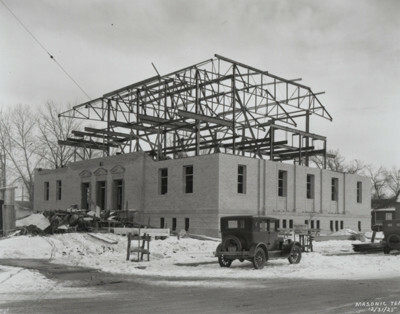 The cornerstone was laid in 1925, with the building being completed and ready for use in 1927. The cornerstone at the Masonic Temple. The building contains many rooms encompassing a total of 29,000 square feet. 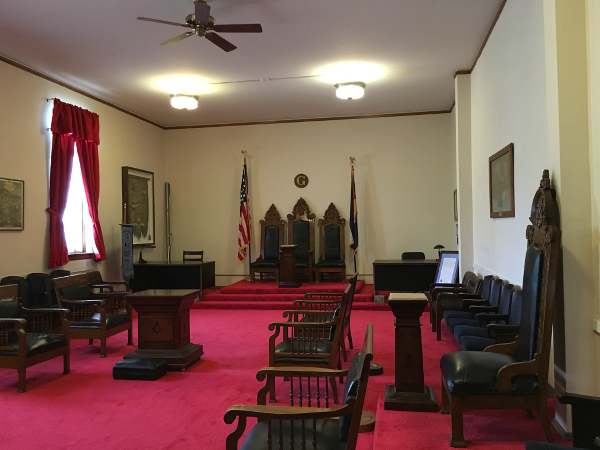 At the time that the Masons moved from W. Mountain to this location, they had over 600 members that would be using the space. Construction continues at the Masonic Temple. December 31, 1925. Photo from the Fort Collins Archive – #H15897. Though many people that use the building today are used to entering and exiting through the nearly ground level door to the right of the grand staircase (towards Howes street), that door was not original to the building (as can be seen in the photo above). 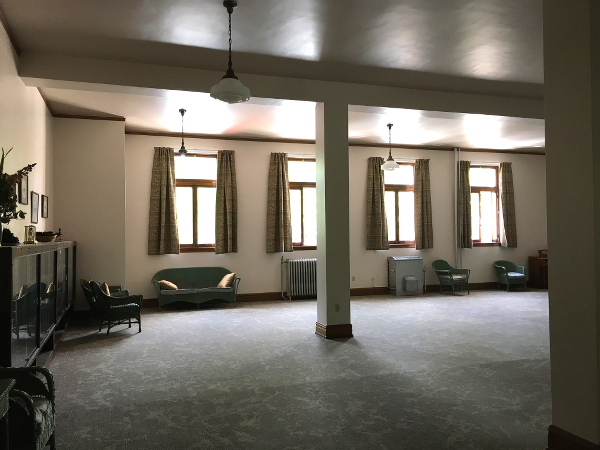 The basement of the Masonic Temple includes a an entry hall, a dance floor, a full kitchen, storage, and a boiler room. 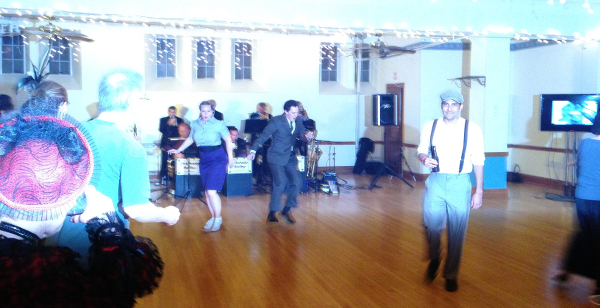 This photo of the dance floor is from the Time Travelers Ball held by the Poudre Landmarks Foundation in 2014. Societies such as the Masons often hold dinners, dances, classes, and so on. So it comes as no surprise that the basement of the building includes a large dance floor. My favorite part of the room? The springs under the floor boards! You can bounce on the floor and hear them squeak. The springy floor means you can dance all night and not have your knees give you guff about it the next day. 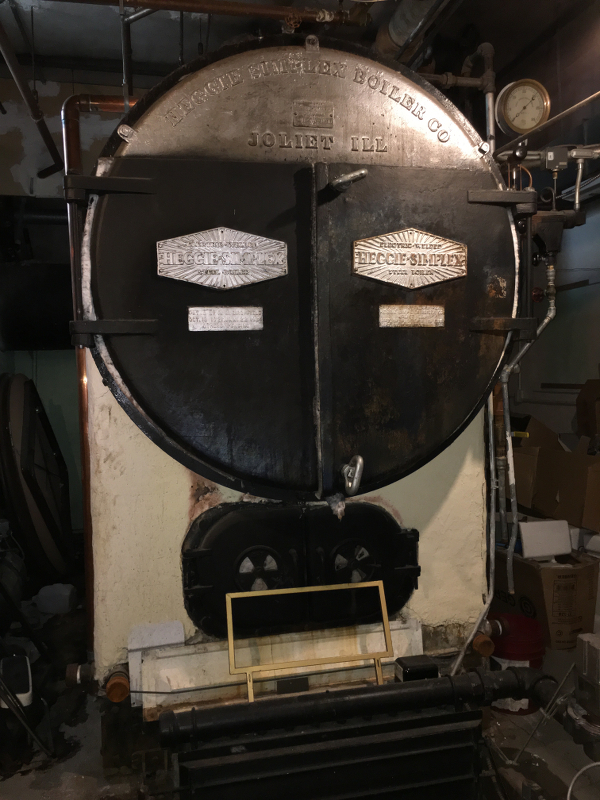 The original boiler. They had to install it, then build the room around it. Check the date on this bad boy. Though some parts of the building have been updated a bit through the decades, walking into the boiler room is like stepping directly back in time. 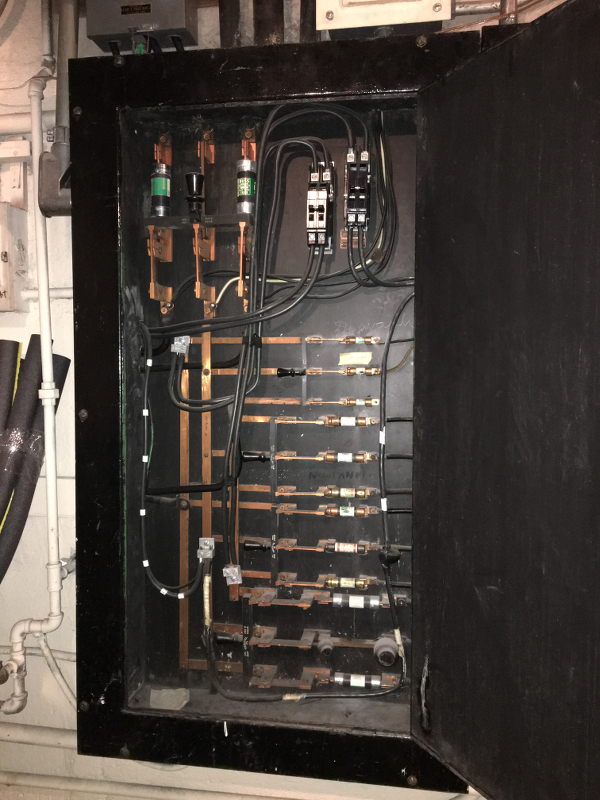 Not only is the boiler original, but one of the fuse boxes is original as well… and still in use! 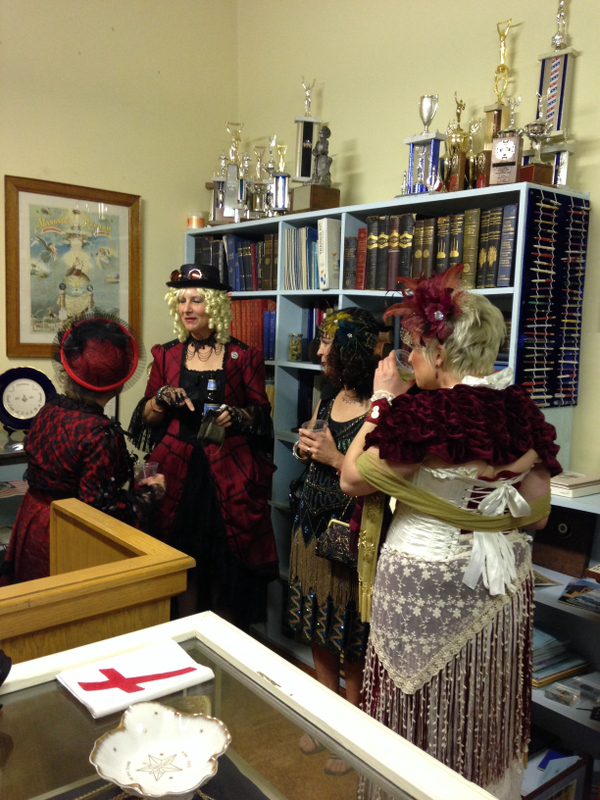 During the Time Travelers Ball held by the Poudre Landmarks Foundation in 2014, several Victorian ladies found their way into the museum room in the Masonic Temple. 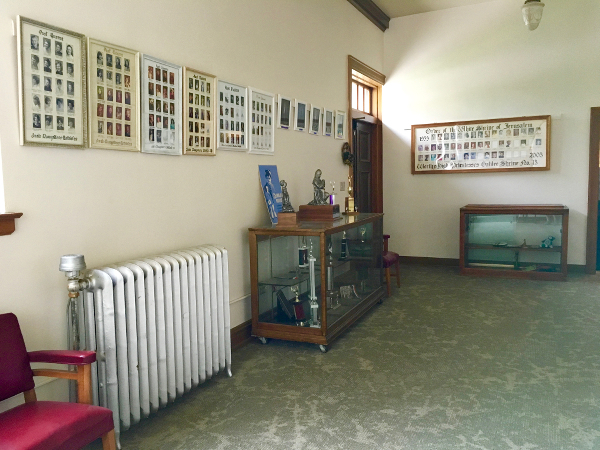 The main floor of the building includes offices (currently being rented out to a small technology company), a small museum covering the history of the Masons in Fort Collins), a smaller kitchen within a larger meeting room, and another carpeted meeting room which used to be the library. Meeting area with attached kitchen. A part of the carpeted meeting room that used to be the library. There’s also a large hall on the main floor that’s lined with photos of women that have been involved in the Masons over the years. Looking through the names (both here and one floor up where the photos of the men are) is like looking through a Who’s Who collection of important Fort Collins families. Note the old radiator and all the photos in the vestibule area. An elevator was added to this part of the building in 1959. It is one of the few major changes that the building has undergone since its original construction. 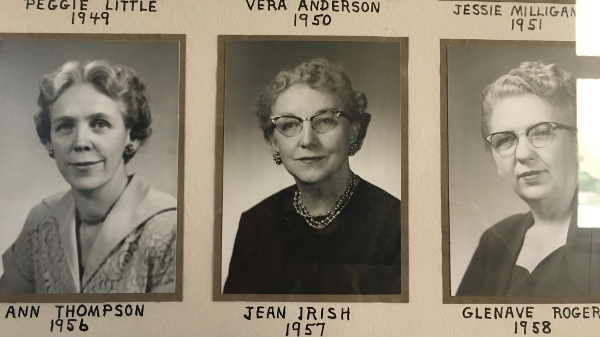 A photo of Jean Irish is also on display in the hallway on the main floor. 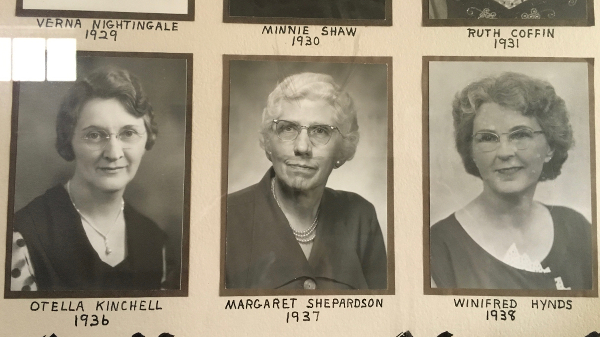 As you look through photos in the building, several people who have had schools named after them adorn the walls including Margaret Shepardson, Jean Irish, and W. Riffenburgh. On the top floor are several more rooms including the Red Room shown above. The ghosts of the Masonic Hall seem to prefer hanging out in this room, from what I hear. 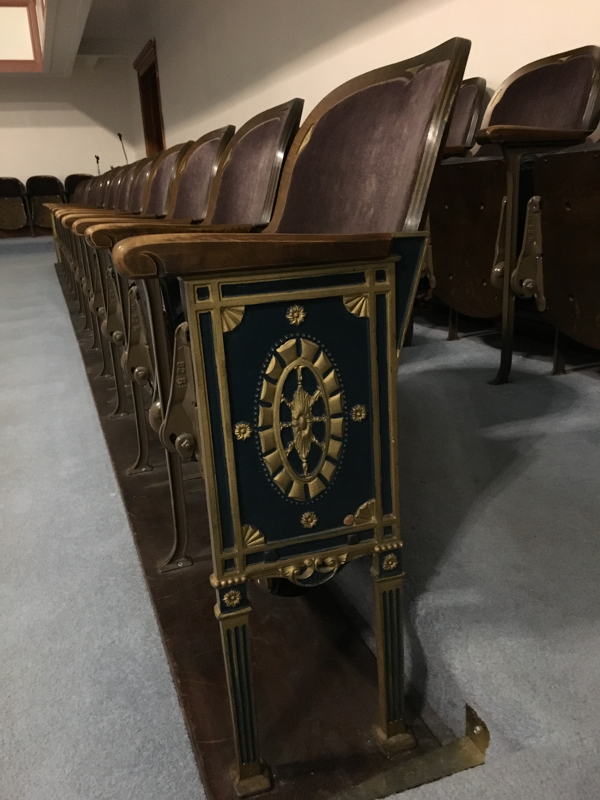 There are purportedly a good number of ghosts that enjoyed their time in the Masonic Temple so much that they have chosen to remain in the building to this day. The chairs along the wall are beautiful and well used. There are even more nooks and crannies in the building that weren’t included in the tour I took. And the photos I’ve added here don’t include all of the areas that I did see in the building. I was touring the building with a couple of other Fort Collins Historical Society members to explore the possibility of moving our meetings here. So if you’d like a tour, keep your ears peeled. I might be announcing just such an event prior to our first Historical Society meeting this year. 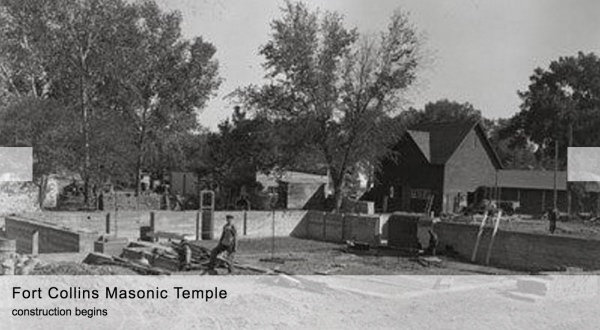 The Masonic Temple soon after its construction. Photo from the Fort Collins Archive – #H12728. 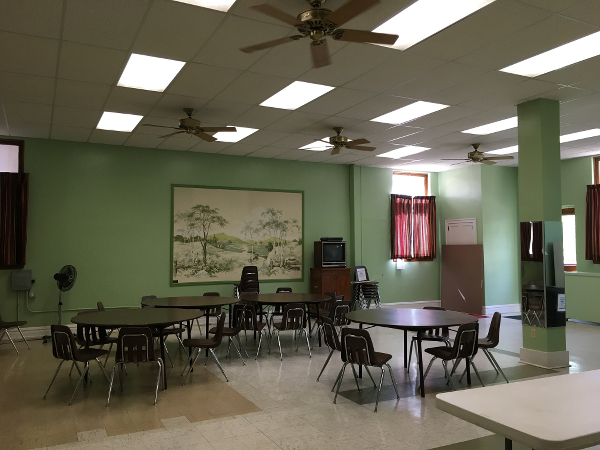 According to Gary Malara, the caretaker of the building, about 60 different groups use the Masonic Temple each month for a variety of activities from yoga classes and dance parties to Masonic meetings and local school events. 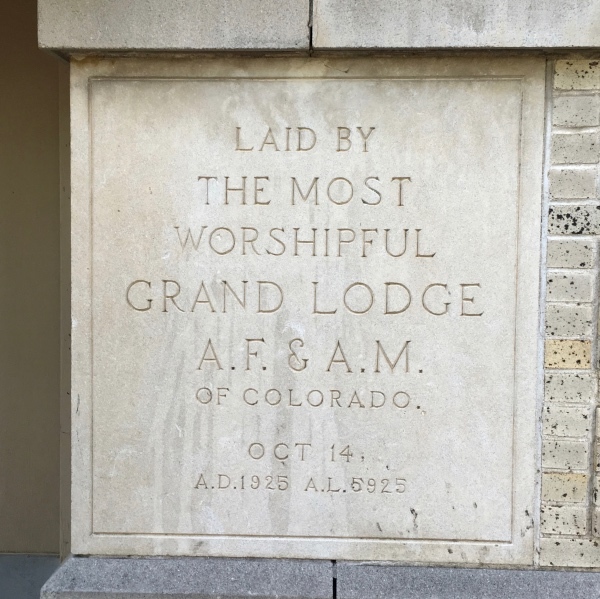 The Masonic Temple was added to the Colorado Register of Historic Places in 2008. It is not, however, a Fort Collins Landmark, despite probably being eligible, which means that if the building is ever sold, it could be torn down. As such an important nexus of Fort Collins history, families, and events, I hope that is never the case. Gary Malara lead us on our tour and a great deal of the history of the building came from him. 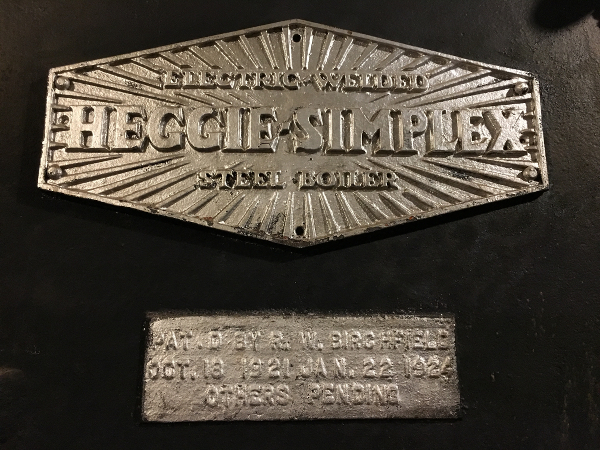 I also used the Colorado State Register of Historic Properties nomination form, which was a good source of specific details such as locations, dates, and architectural information. Wonderful article. Thanks for doing it. 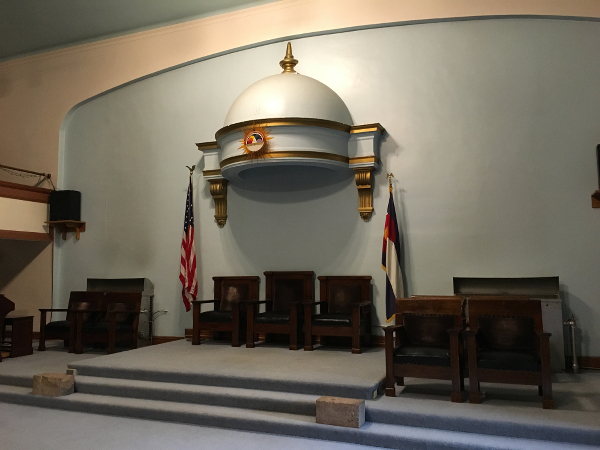 It’s one of the many Crown Jewell Masonic Temples in Colorado. The pictures of the women are those of the “Worthy Matrons” who served as the presiding officers each year of the Order of the Eastern Star, one of the many Masonic Family organizations we support which also include those for young ladies, Rainbow and Job’s Daughters; and young men, DeMolay.